Welcome to the world of Down In Flames! We published our first Down In Flames games about 8 years ago, and they focused on WWII dogfighting. Locked-On brings the award-winning series into the jet age and features aircraft as far back as the Korean War in the 1950's, including the F-86 Sabre, all the way up to modern aircraft like the F-15 Eagle! 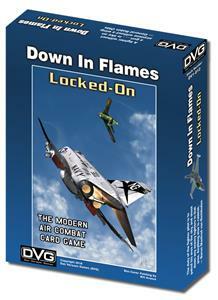 Locked-On is a stand-alone card game that uses a unique Action/Reaction card mechanic that simulates the maneuvers aircraft perform in combat. This system also puts you in the cockpit to make the split-second decisions that will determine your success or failure in combat. Locked-On is for 2 or more players and plays in 15 to 30 minutes!